We are sorry to inform you that this item is out of stock. Click the box on this page and a voucher for a tailored shirt will be added to your bag. Then choose either 2 or 3 accessories from our collection. 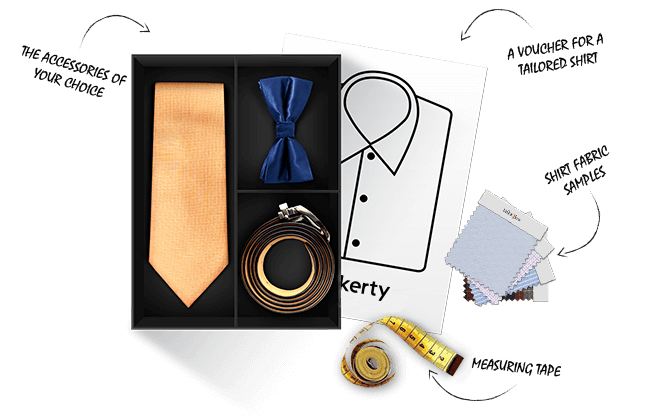 A Gift Box includes a voucher for a tailored shirt and the items that you prefer from our accessories section. We recommend that you choose either 2 or 3 accessories.The shirt voucher is automatically added to your bag when you select a Gift Box. Your shirt voucher and accessories will be placed in one of our Gift Boxes with the Voucher Redemption Instructions, free shirt fabrics samples and a tailor’s soft measuring tape. Other coupons and discounts cannot be applied to the shirt voucher. Hockerty Gift Boxes and Gift Cards are non refundable and cannot be transferred, exchanged or resold and cannot be redeemed for cash.